We believe that worship is the beginning of all life because it is centered on the God who has given us our life. Worship is unique in our experiences because, if it focuses where it should, we are taken—even if just for a few minutes—outside our own confined world of wants, needs, and struggles. Worship is unique in our experience because participation in any service could result in a change of life, for the better…which is more than we can say for many of the other activities and pursuits that might claim the same time. Our Mission Statement says that Bentwood Trail Presbyterian Church is a congregation that “worships traditionally…and explores new expressions.” Our worship is biblically based, directed by the constitution of our Presbyterian Church, and influenced by our Reformed heritage and the ecumenical experience. We seek to combine the best of our historical roots and contemporary expression. Sunday morning worship service is at 10:30 a.m. This service is what one might call a traditional Book of Common Worship service. We believe the service is structured without being stiff. It follows a familiar praise-confession-word-response format. The music is led by the choir and a very fine pipe organ. 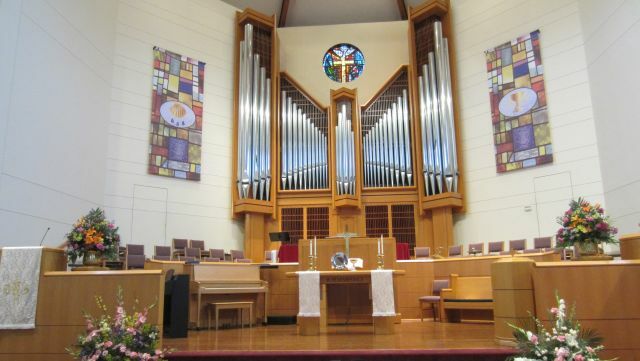 While we use standard hymns and doxologies in the standard places, ordinarily accompanied by the organ, we also use appropriate praise music, led by piano and keyboard, as service music and responses. The sacrament of Holy Communion is served on the first, third, and fifth Sundays of the month, plus liturgical “festival” Sundays. We also have services at other times such as Ash Wednesday (the first day of Lent), Maundy Thursday and Good Friday (during Holy Week—between Palm Sunday and Easter Sunday), Thanksgiving Eve, and Christmas Eve. There is never any kind of “dress code” for any service at Bentwood Trail. Communion is offered to all baptized Christians, regardless of denominational tradition or church membership. Although we recognize all modes (sprinkling, pouring, and immersion) of baptism, our usual mode is sprinkling. We believe that baptism is administered only once and we recognize any baptism by water in the name of the triune God administered in any Christian denomination. Baptism is offered to those making a profession of faith and children of at least one believing parent.